I first discovered Jean Moss' designs back in the late 80s/early 90s and I've been a fan ever since. Her Sculptured Fair Isle was one of the first sweaters of hers that I knit back then and I continue to wear it to this day. It's a favorite, timeless and draws compliments regularly. My blog post about this sweaters from August 13, 2010 is here. When I heard that Jean had a new book coming out I got very excited and when she asked if I'd like to review it, I was thrilled. Jean's new book is Great Little Gifts to Knit and it is very timely, given that many of us are about to start knitting for Christmas. However, the projects are wonderful for any time of year. 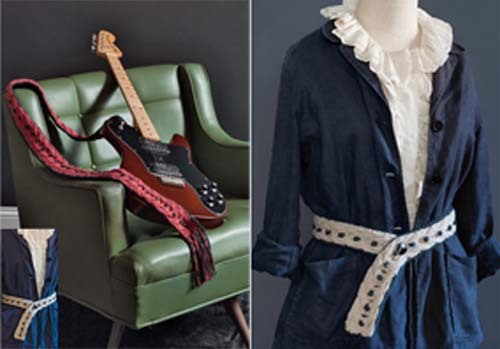 There are 30 projects to choose from and a variety of techniques - something for everyone. Having a 10-month-old granddaughter and 3-1/2 year old grandson, I was immediately drawn to the beanbags. She would love to hold and squish them as she's getting acquainted with the look and feel of everything around her. He is learning his numbers and I envision playing games of catch, e.g. toss a "2" to me, or "how many ducks are on the beanbag"? I also think these would make a nice gift for a person who sews, just add plenty of stuffing and you've got a pincushion - quick and easy gift. The other thing that came to my mind when I saw these is that it would be a good project for someone who wants to try out intarsia, one of my favorite knitting techniques. The Baby Shower set pulled at my heartstrings as it brought back memories of following my first patterns and making gifts for friends when they were expecting. Back then I wasn't brave enough to attempt to knit a thumb in a mitten, and it's not needed for a newborn. 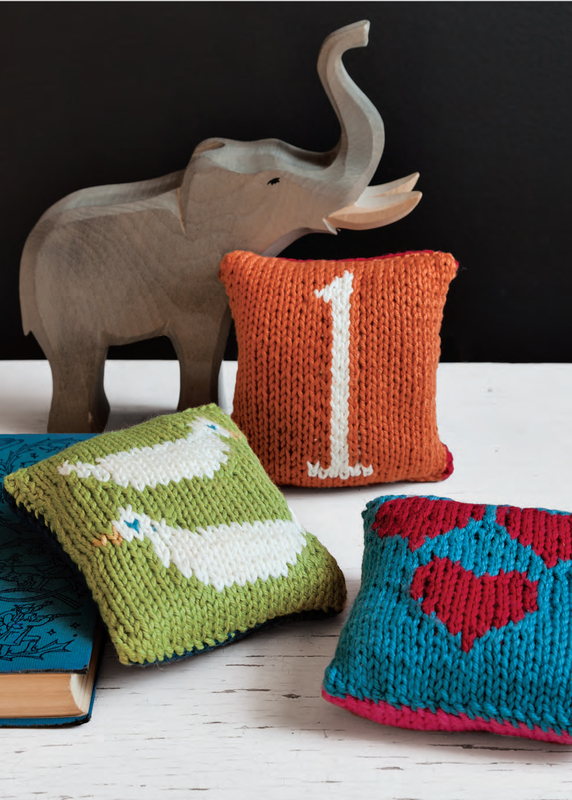 This is the perfect pattern for a new knitter, but also good for anyone who wants to make a charming gift to give to the expectant parent. The added embellishment of the flower on the cap and shoes is adorable, and can easily be left off for a baby boy. There are plenty of patterns for grown-ups, too. They haven't been forgotten. You can choose from shawlettes, leg warmers, berets, mittens, socks and more. 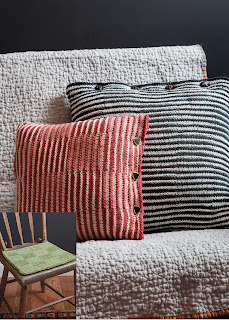 There are even projects for the home: placemats and pillows. I like the cushions and I'm betting that one of them will be on my needles before long. There are so many other projects in the book and I could go on and on. These were some of my favorites. You can get a copy of the book for yourself at Amazon. CONTEST: I know that you're going to want a copy of this excellent book and Jean is giving one away by way of my website. All you have to do is go to the gallery on Jean's website and look at the projects. Then, come back here and leave a comment on this blog post. Be sure to leave a way for me to contact you. You can leave an email address with spaces inserted so that it can't be picked up by any automatic gatherer. Tell us what project you would like to make first, for whom, and what would be the occasion. Perhaps it's a beret as a Christmas gift for a friend, or a tea cozy for a favorite teacher. On Monday, September 16th a name will be drawn at random and the winner will have a choice of a hard copy or digital download of "Great Little Gifts to Knit", shipped directly from the publisher. Good luck! I think I would knit the "Glow Beaded Wristlets" for my 2 nephews' wives for Christmas or the McDougal Dog Jacket for my dog, Joe. I think my husband needs the cable beanie. I always make him fingerless mitts, which leaves him with cold ears! And the jive legwarmers would look cute sticking out of my daughter's hiking boots. I'm at kimberlywiggin (at) sbcglobal(dot)net. I would make the baby set for my nieces new little girl. She had heart surgery at less than 2 days old, so she deserves something extra special. 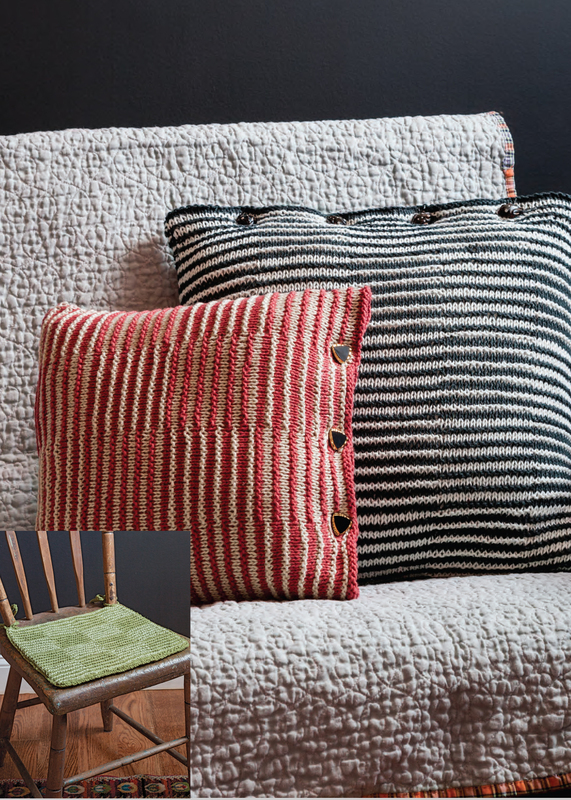 I have the perfect yarn to make the shadow knitte pillow covers, which would be for ME! I'd make myself the tea cozy in honor of tea weather coming up around the corner. It's a toss up....seat cushions for my son's new house or the headband or hat for a Christmas gift. So many tempting projects... I keep changing my mind which would be knit first! For myself it would be the tea cozy but I really should start with Christmas gifts! 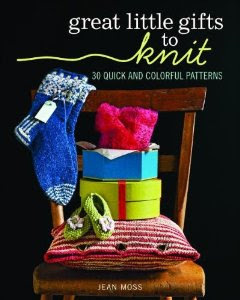 The book itself would be a great gift for knitterly friends. I would knit the Welcome Toran for our home, the only occasion is that it' gorgeous! The turban headband.....I am into vintage and stash busting.....I have drawers and baskets from the early 70s!! I like the baby cocoon--a great last minute gift idea. There are so many wonderful projects but I'm favoring the baby cocoon for all the new wee ones in my life! I would knit the Odalisque headband/hat for myself. I love the 40s look of it. I am always looking for accessories to combine into ensembles and this pattern would fit in nicely. Congrats to Carmen N on winning a copy of Jean Moss' wonderful book. I'll be in touch with you so that we can arrange delivery.